​In this article, we short-list the top knee pillows that are currently on the market. Our aim is to provide you with the essential information needed to decide which is the best knee pillow for your needs. Knee pillows are kept between the knees or between the thighs to separate and support the legs. Do not let the name confuse you, knee pillow only partly relieve knee pain; they are mostly used to relieve hip and back pain for side and back sleepers. If you thus have pain in any of the three parts, you may need a knee pillow. Side sleepers place this pillow between their legs while back sleepers place it below their knees; either way, it offers enough support to the user. It is a daunting task choosing a good knee pillow from the sea of pillow brands in the market. The best knee pillow for you should suit your sleeping style, help ease your pain and offer you a long productive life. Below we have compiled the top knee pillow reviews based on a criteria explained later in this guide. Why Do You Need A Knee Pillow? If you suffer from sciatic or nerve pain, you might consider purchasing this pillow. It was designed to relieve sciatic, nerve and lower back pain and hip discomfort. Made of 100 percent memory foam, this pillow comes with a great support-comfort balance while at the same time alleviating the pain in your body. Though it does not feature new technologies, the pillow is ergonomically designed to enhance a straight spinal alignment to not only reduce pain but also prevent it. The contoured design of the pillow helps improve blood circulation while molding to the shape of the user's legs. The zippered cover of this pillow is easy to wash – machine washable – and breathable thereby ensuring comfortable sleep. Seeing that memory foam retains heat, the addition of a breathable cover is advantageous. The manufacturer offers 100 percent money back guarantee to customers. Amazon.com reviewers are happy with the great customer service offered by ComfiLife, the great performance of the pillow and the awesome price. According to the reviews, the pillow does not lose shape and lasts long. However, a number of reviewers have complained of the pillows firmness the first few days of use. The Sciatic Nerve Pain Relief Knee Pillow was created for side sleepers; it is best for leg, knee, hip and back pain relief and offers a great balance between comfort and support for spine alignment. It is designed in a cushy form. You do not therefore face the problem of choosing between a wide, soft and firm pillow as you can get all these qualities in this cushy form pillow. The pillow is recommended for use after hip replacement or knee surgery, during pregnancy and maternity and while sleeping to avoid back, hip and knee pains. The removable washable cover keeps the sleeper cool during the night thanks to its breath-ability. You can place this pillow between the legs or under the knees and works well with side sleepers. It improves blood circulation of the user. 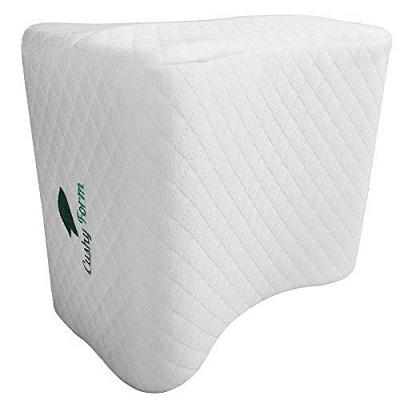 The good thing with cushy foam is that it is 100 percent viscoelastic memory foam. It is hypoallergenic and resistant to dust mites. This pillow is sold with 100 percent money back guarantee in case you are not satisfied with its quality. Even better, it is offered with a free storage and travel bag. It measures 10 x 5.5 x 8 inches and weighs only 14 ounces. Amazon.com reviewers love this pillow as evident on the horde of positive reviews given. Reviewers cite that the pillow is easy to use and suits people of all sizes. Most importantly, a high number of reviewers say that the pillow really gets rid of knee, hip and back pain. The main issue raised concerning this pillow is on its length with reviewers saying it should have been longer for better support. If you are tired of the frequent knee-to-knee friction that you experience when you try to sleep on your side, you might want to try this pillow. It was designed to prevent knee and hip pains while still relieving the named parts of any pain that may exist. True to its name, this pillow is easy to use, just pull it on and position it where you need – either below your knees or between your legs – and you will be good to go. It is lightweight and sports a comfortable feel. 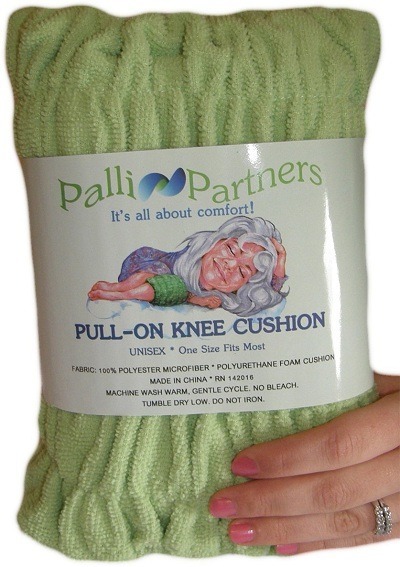 The Pull-On Knee Cushion is made of stretchy and plush polyester microfiber that has been infused with the correct amount of padding to ensure comfort and support. It is mostly for side sleepers though back sleepers can also reap some benefits from it. Both men and women can use this pillow and it is machine washable making it a great choice for children. It is recommended if you have just had a knee or hip surgery. It only weighs 4.8 ounces. On Amazon.com there are lots of reviews in credit to this pillow. Most of the reviews cite the comfort of the pillow and its ability to relieve users of knee pain. The pillow's size is perfect for all and it comes great for side sleepers. The cushioning and the stylish look of the pillow have been praised too. The main problem however arises on the less support that the pillow offers. Most people may not be using a knee pillow because they do not know what benefits it may add to their sleeping. Basically, you cannot trivialize the importance of a knee pillow. This is mostly important for side sleepers who need two pillows; one to support the head and another to separate the legs and support them. When you sleep without a pillow in between your legs, the upper legs stay free and can pull on the spine. This will lead to hip and lower back discomfort. With a pillow tucked between your legs, the upper leg assumes a neutral position thereby keeping the spine aligned well and reducing back and hip pain. Conditions such as sciatica, slipped disks, scoliosis and osteoarthritis among others cause discomfort during sleep. If the above conditions affect you or have ever affected you, a knee pillow will enhance circulation of blood and keep you feeling comfortable at night. These pillows are made of a soft material that ease the pain you may have. The knee pillow is highly recommended during pregnancy as it reduces the pressure on the knee and reduces twisting of the hip joint. While you could use a body pillow instead of a knee pillow to separate your legs while you sleep, the former takes a lot of space and may not be ideal when you are sleeping with a partner. Body pillows are bulky and may not fit well between your legs. Another benefit of having knee pillow is that it is easy for you to assume a sleeping position that feels comfortable as it gets all your body parts in agreement. When you reduce the tossing and turning that you may experience the first few minutes you hop on to your bed mattress, you will relax easily and fall asleep fast. With a good night's sleep, you wake up relaxed the following day, have a better outlook and can accomplish much with all that energy. 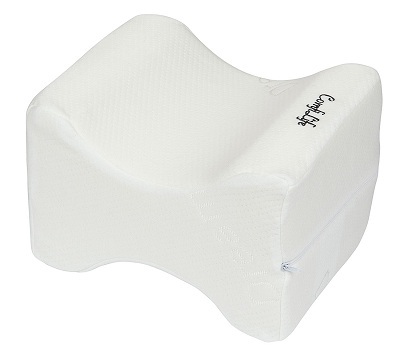 A knee pillow should have a perfect comfort-support balance to deliver all the benefits outlined above. With the high number of knee pillow brands, it may be a challenge getting the best knee pillow for you. The advantage of memory foam is that it conforms to your bone structure. It is firm enough to offer support and still soft enough to offer comfort. Bed mattresses also use memory foams for great relaxation. This material is great in heat retention and will enhance blood circulation. Though heat retention can bring discomfort, most pillows come with a breathable cover for temperature balance. Unlike other materials, memory foam does not get flattened permanently even after a few years of use. There are different shapes of knee pillow including wedge pillow, long knee pillow, hourglass shape knee pillow and hypoallergenic knee pillow among others. You need to choose a pillow that gives you comfort while you sleep. While someone may get comfortable on a wedge pillow, it does not mean you also need a wedge pillow. A wedge pillow is shaped like a pyramid and is ideal for back sleepers who like keeping their knees slightly elevated. The long pillow comes in the shape of a body pillow. It is used to cradle knees when you sleep on your side. One leg is placed on top of the pillow and another one under the pillow. This pillow is popular thanks to the fact that it is a good fit for all. Hourglass knee pillow, like its name suggests, is shaped like an hourglass. This shape allows it to stay in between your knees without slipping at night. Hypoallergenic knee pillows are thick knee pillows designed to reduce pressure on the hips, shoulders, lower back, knees and neck areas. Some people use regular body pillows folded in half to act as wedge pillows; however, these keep moving at night thereby causing discomfort. The firmness of the pillow will determine the support, comfort and durability of the pillow you choose. A soft pillow may not offer the needed comfort and may flatten within a few months of use. On the other hand, a very firm pillow will cause discomfort on your knees. To this end, you need medium firmness. A thin pillow may not separate your legs enough while a very thick pillow will raise your leg uncomfortably. A knee pillow should just raise your leg to keep it in line with your hips. For great results, buy a pillow whose density is three pounds or more. Anything less than that will either be too soft or too thin. With the criteria above, ComfiLife Orthopedic Knee Pillow takes the crown for the top knee pillow. 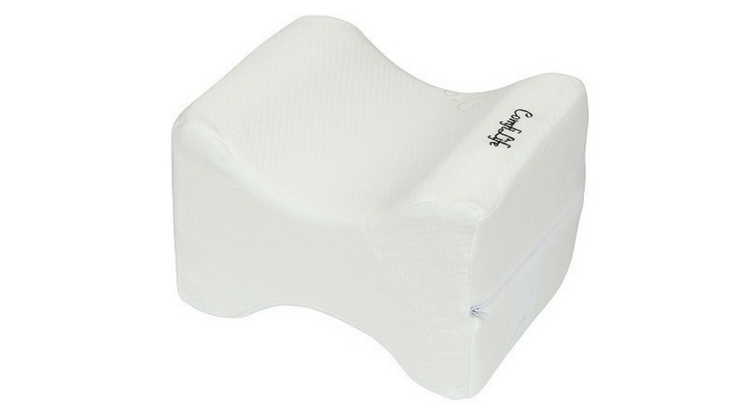 This knee pillow can be used by side and back sleepers alike. This is a memory foam pillow which means that it molds to the shape of your bones while still offering you enough support for a long period. With its contoured design, it offers comfort and helps you relax. It is comfortably warm thanks to the heat retention quality of memory foam and the breathability of the removable cover. 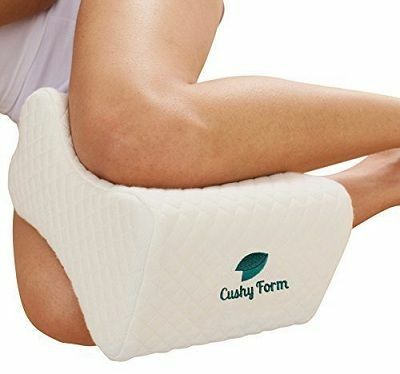 According to reviews on Amazon, most of which are positive, this pillow is great in reducing sciatica, knee and lower back pain; and this is what matters, right?